Work for Commvault Complete Backup & Recovery? Learning about Commvault Complete Backup & Recovery? "Robust Tool for Enterprise environment"
Remote installation and configuration of backup is very good. Under security we can set up a group of user with different access set. that is very good option. When we contact the support and need to send the logs it is very easy to share the logs as it is integrated with job. Support is very good and Engineers give very good information on the issue we have opened case. Documents and KBs available by COmmvault is very good.Even their training is also very good. It is complex to explore as it is having vast option. Restore of expired data is little complicated as compared to other environment. If the environment is large with all the possible application and domain then Defiantly choose Commvault as your solution. Their data retrieve is very simple and easy. specifically email archive and retrieve. We have configured eMail archiving for the exchange and has very helpful for restore the mailbox or emails as it is very quick and easy. Audit trail report has provided the detailed information about the changes made to the policies and who has done it. It is an excellent backup tool that makes our lives easier. Also, their knowledge base is very helpful. Live support it is awesome, very professional staff who know what they are doing. It is a little bit complicated to set it up. You need to be careful while creating the backup types and times. You cant create a media agent without having the hostnames. Since we implemented Commvault we have solved many issues when losing important data we lost. The main benefit is that we need to recover a file we can do it anytime, also we can set up as many types of backups as we want (full, incremental). Also, their console alert it is extremely useful since you can identify easily if there is an issue when doing the backups. Fast response when talking to them via chat or phone. You have all in one software and in just an administration console. The deduplication and compression ratio you get from the backups help you a lot to store all backup depending of the policies of retention that you need. To understand all the function or the capabilities is hard, you must take a course to understand how simpana works. The admin console is not to intuitive so you need to figure out where are the option that you need. For this is mandatory take a course if is the first time you use commvoult. We have the security that our backup works and now we can restore with the confidence that the backup will work. We can do a backup of our ecosystem, we can use the APIs to do better backups of our application like Oracle, MSQL, SharePoint, windows server, Linux server, etc. "Commvault it is a enterprise backup solution for all your needs"
Well let me tell you that Commvault its really a full feature set of backup solutions for all your applications and virtual environment needs. I like the fact that in a single pane of glass I can have all my physical and virtual environments backup. You can define a a very customize backup policies that depends of the application needs. We use it mostly for oracle databases and VMware virtual environment. You can have multiple copies and algo the archiving feature its really neat. Just let your policies handle the automated backup jobs and your're good to go. Ok. let me tell you that in order to use the software to its full extend, you will need to take training. You need to know very well how policies are define and hoy can be schedule and use. So I have to say that it is not a intiuitive product. It has a little of complex to administer it the right way. Do a PoC to know how the backup solution works and if it is what are you looking for. Also if you are buying, then is a must to include training. Before Commvault we had around 3 tools to do the backups of all our applications (virtual and physical), now that we have it for over 2 years, we have automated the backup process really well. Just sit down and let commvault do its stuff. "Very powerfull software to made Backups"
The integration with al types of platforms. The power console and strong software. The integration with Netapp software and more and more. Commvault is constantly updating theis software and the support is very good. The search of content to backup is easy. The price of Commvault is not cheap. Sometimes is complex to understand the cycles of backups. You need a lot of types of licenses to use the powerfull of the software. We can control a very vast variety of systems and softwares to make backups with one sofware only, on ly one console. "Commvault - The Comprehensive Backup Solution"
One of my favorite features of Commvault is the reliability of backups and the reporting features. When you set up scheduled backups, you can rest comfortably knowing they'll complete. If there is a failure, you get near immediate notification of the failure. I dislike the GUI - it is a little hard to navigate until you really learn the ins and outs of it. We are using Commvault for all of our backup/restoration needs. We have realized how easy it is to quickly restore SQL Database backups in a pinch. "Maybe the most comprehensive backp software on the market." Well, it's quite impossible to enumerate all the software can do ! You can backup anything : any folder on any servers, complete virtual machines, all kinds of databases (there is an agent for SQL, Oracle, etc), active directory. You can manage all the different works by using storage policies (retention time) and schedules. Also you can create personnalized reports which will help you to keep an eye on your backup activites. Restore activites are very easy, just select your system, the date/time then click on browse and restore to find the files you're searching for. About support, it's always possible to reach Commvault support team very quickly and they are always able to answer our questions. As it is a quite huge sotware, the implementation is a relatively hard process. You will spend a lot of time to fine tune the software if you're in a complex environnement. Hopefully, when implementing, you can be assisted with peoples from Commvault who are very nice and helpful. If you need to backup multiple kinds of system and data you should consider Simpana ; so powerful ! We're backuping all of our data and virtual machines. The user support team is able to process restores easily and quickly when users needs deleted files. For the infrastructure team, it's very helpful to be able to restore complete virtual machines after some disasters ! "Backing up All the Things..."
I like the ease of use of this product, just load the agent on the server, or virtually point it there and BAM your all set. the single user interface makes it easy to see what is going on when you need to see it. I can't say that there is anything that I dislike about it since this is the only product that I have ever used, so I don't really know about other products or could truly compare it to something else. well the problems that we solved is that we didn't have to have a "dedicated" backup administrator. the simplicity of this product allowed all of the members of our team to be able to quickly and easily pick up on how this product runs and what's going on with it on a daily basis. "Good support makes up for a kind of clunky product"
Oracle database cloning works pretty well. If everything did work I would say the interface is ok, if extremely large and complex. Where do I start? Delivered features were not as described. We ended up having to purchase additional software to achieve the email archiving functionality promised. Lots of additional proxies were required (and a Server 2012 license for each one). The industry-leading customer service was exactly the opposite. Took forever to get resolutions. Commvault representatives berated me for trying to get escalations for problems that turned out to be known issues. Tech reps unfamiliar with new features. One VM still not backed-up after one solid week of tech support and escalation. edit: After 5 months and one Service Pack patch things are running fairly smoothly. The application is still prone to unexpected failures along the path from agent to proxy to media server however the tech support is prompt and effective. I suggest comparing with Unitrends. Reliable backups and simple and quick restoration of data, including Oracle. I don't think there is an environment that you could use today that Commvault can't backup. Their integration points are outstanding. The UI is pretty intuitive considering the power you wield with your mouse. It's always reliable, especially when it comes to restoring your data, provided that your tapes, disk, etc. are available. Cost & complexity. Deploying Commvault is not for the faint of heart. There are ISO upon ISO needing to be fed to deploy features. Last time I downloaded, it was nearing 10GB in size. If you have an enterprise that requires outstanding backup & restore capabilities, Commvault will easily fit the bill. CommVault was a good platform with a lot of powerful tools like dedupe and archiving. Once setup things ran very well. Probably the best part was that it was a backup software and not particular about what storage medium you use. In retrospect, we really needed a person dedicated just to the commvault product to stay on top of the backup and recovery process. With employee turnover, much has to be retrained and retaught to keep the system operational. Make sure you can dedicate plenty of internal resource to keep this system running. Without a dedicated Comvault administrator, this product becomes wieldy and unstable. Deduplication of data and archiving of old stale data was super important in our decision to use CommVault. We also already had a lot of storage medium to use, so we didn't want to have to buy more storage just for backup. "With Great Software Come Great Sacrifice! " Covers pretty much every software type there is available. Integrates with most APIs. If you have an RPO, you can meet it with their software. Software took user intervention out of the the equation. Alerts told us when things were needed or tapes changes. Cost was steep. Was sold a solution that was unable to fulfill promises. CommVault tried to resolve but was very slow and were still unable to fully resolve all hardware bound issues without further cost on our side. Make sure to properly size and do not think anything less than SSDs should be used for DeDup or OS drives. Depending on yours size and complexity of backups, a dedicated and knowledgeable individual would be needed on staff. This software is not for the faint of heart and will require some care and feeding. Price is steep. If you are going to use DeDup DO NOT SKIMP ON SSDs. SEED, SEED, SEED. Great support, use is heavily! Solved individual server backups to tape. Single pane of glass for doing backup. Without this software, there were many missed backups due to hardware issues to tape. Restores took hours to perform and were unreliable. CommVault completely changed the way we thought about backups. Item level backups inside applications like SharePoint. Restores directly to SQL. Onsite retention with replication to secondary site. "Great backup software for global use"
1 management commserve host to access all locations backups and media agents. if you have a big team with a lot of servers in multiple locations, this is the way to go. one global solution, easy to push out reports and have local IT people manage. "Very promising enterprise data protection solution "
Simplified manageability of complex functionality and vast support of every applications and tightly integrated with applications. Also excellent customer support. Integration with most of the cloud vendors. It is providing tools for automation which is very good. Commvault deduplication is one of the best , we are getting very huge saving of destination space and also better backup time because of client side deduplication. Not sure if I am correct but I feel it is bit costly compared to other vendors but after capacity based license it can be used by mid range companies as well. I mainly suggest it is because simple to manage all the features of commvault from single window. Faster backups with best deduplication direct could backups. Quick response from the customer support . Vmware integration for backups and restores reducing our work of managing individual servers. Integration with could allowing us to support our cloud adoption model. "Commvault: A Daily Learning Experience"
The support team at Commvault is beyond amazing. I haven't met a problem that a collaborative effort with the team can't fix. Every feature ever asked for from the inception of the product is still within its administrative console and this can cause issues in use. It's a double-edged sword. Remember that this is a very extensive solution to backups/data management. Approach with a good understanding that you don't know everything and keep the online books close. A lot less frustration will happen this way. Backup your VM's and O365. Also has a compliance search option for audits. Backup and restores, has great support! "Powerful software for the GUI lover in you"
There are so many useful options to Simpana 10 that I am not sure where to start. In no particular order, I would say that the single pane of glass GUI for archiving and backups is useful. The set up of security and what other users can access is very simple and works well with active directory users and groups. Most of the menus to access things are within 3 clicks of your mouse. The intellisnap backups are very useful if you have the SAN space. I like the easy to set up reporting system that tells me my growth rate and details for successful / failed backups and restores, and have them emailed to select individuals or groups. No need to set up any BLAT emails or utilize a separate software like Opscenter for NetBackup. There is also a very useful right click job option called resubmit job. I am very fond of the search function for restores too. It works infinitely better than the NetBackup search function. Installing the client on servers can be done right through the GUI or you can run the software manually on the server. Updating your client software to the latest patch is made simple just by right clicking on the client and clicking install software / update software. This is a very robust software with so many options, no wonder they are on top of the Magic Quadrant. The only thing I disk like about Simpana 10 is that the interface is a JAVA GUI and it is sometimes slow to respond, although I was told they are moving away from this with version 11. I would seriously recommend looking into Commvault Simpana 10 for your backup needs. I have been very satisfied with my choice. The problems we had before the migration to Simpana 10 disk based backups were getting backups to finish within the nightly backup window, hourly native SQL transaction log backups, and file system archiving. Commvault was able to square this all away with a single pane of glass interface. As an administrator, one of the most painstaking things to do is go over logs. NetBackup logs seem so convoluted and difficult to read as opposed to Simpana 10 logs. Also I don't have to log into so many different servers to find the logs. I can get logs in Simpana 10 just by right-clicking on the job and hitting the view logs option. So simple! We use commvault as our enterprise backup. When I came here a year ago we had multiple backup systems that we were using and still use. My goal has been to roll out the commvault backup system to every area of our organization. So far there is not much to dislike about the product. It really does what they say it can do. I would definitely recommend Commvault to anyone looking for a robust backup system. Being a Financial Institution it is imperative that we backup our systems. Commvault does that for us. The benefit we are looking for in the long run is to have one system and one system only. 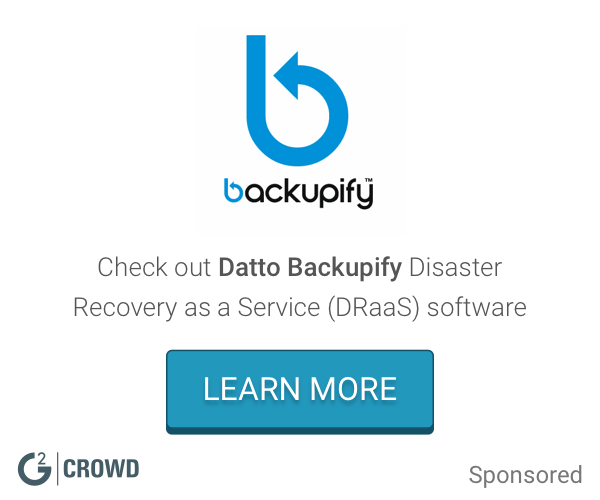 "By far one of the best Enterprise Backup Solutions"
This is a very simple to use and intuitive backup solution which is quite simple to configure and architect from scratch. Once you get use to the GUI, there is not much to dislike about Simpana. Ease of backups and restores. Backup times are fast and efficient. Restore process is fast, efficient and effortless. "Amongst best backups systems I have taught"
As a certified technical instructor, I have taught many systems, applications, and packages. CommVault Simpana is a powerful reaching backup system that proves easily integrated and compatible with virtual environments. CommVault's Synthetic backups are a great time saver. Also strategic placement and design allows a central CommServe allows admins to rebuild any protected portion of the environment. CommVault provides excellent all inclusive coverage; while more pricey than some of its competition, it provides a much lower total cost versus more a la carte systems. These a la carte systems prove to be penny-wise and pound foolish in enterprise deployments. CommVault has a complete reliance on squeaky-clean DNS, even for the simplest of deployments. The slightest error or compromise break the CommVault network; completely incompatible with LMHOST files. CommVault may be too expensive for smaller, simpler systems. Ensure your network's DNS is squeaky clean; the slightest error or compromise will break you CommVault deployment. Also ensure you purchase the appropriate iDAs for your environment. I had to teach my customer's users how to protect their extremely customized, secure, and portable SharePoint/VMware networks that were deployed in austere environments. "CommVault Simpana from a daily user"
Quite simply, it works! We switched ti CommVault Simpana back in the version 7 days. We've stuck with the the product through every product revision since. The user interfaces are clean and intuitive. Media agents arent candidates for virtualization. CommVault is the last thing standing to keep me from being 100% virtual in my datacenter. Business Continuity in the event of a disaster or data corruption. "Great backup product with boastful archiving claims"
CommVault Simpana has been refined into one of the leading edge backup and recovery products in the market today and that innovation is a driving force in my recommendation of it. Its capabilities are truly unique in many areas such as single pass backup for granular recovery as well as storage management archiving. Its performance as a backup product may not be the "fastest" but when I backup data with CommVault Simpana, I know I will be able to recover it in a timely fashion as CommVault has done a particularly good job of ensuring data integrity and recoverability which is the often overlooked point of backup products. CommVault's claims to having a market leading archiving product is misleading. Yes, CommVault Simpana offers great backup integration for tiering data and archiving older, less accessed data and it works. However, this integration of backup and archive comes at the expense of user ease of use. My opinion and that of many of my customers is that archive data should be transparent to the users; they should not be able to easily diffierentiate between production data and archived data and in this CommVault Simpana is lackluster. Users are forced to recall the attachments of archived messaged through the browser or search interface unless they have an offline content cache which many organizations feel is burdensome. While the data is accessible from the web search, it can be cumbersome to users not intimately familiar with the interface. CommVault has reduced the storage footprint of backups in many of our customers' environments and using its deduplication options, has improved the efficiency of backups dropping backup windows as a result. The product is very stable and backups are easy to set up. Restores are also easy to do. Support does not always take ownership on issues. I have opened a couple of tickets where they would to point back to another vendor. I ended up figuring out a solution on my own. Always do a POC trial with products to compare and see how they will fit your needs in your environment. A backup solution with long term retention. The ability to back up just about anything your heart can desire; databases, vms, folders, active directory. The ease of management is also a nice feature as long as the ability to customize to our needs. Implementing this was a little more difficult than anticipated. The software is definitely complex which is always a good and bad thing for these types of tasks, but luckily the support option is always there and they are easy to reach. Backing up anything and everything that is necessary, especially to assist in our DR efforts. "Commvolt back up managment software "
"I enjoy the ease of use with Simpana backups!" The fact you can get it in an all-in-one appliance from STORServer makes it more appealing. The intuitive CommCell management console is easy to use for configuration and status review. There are so many feature available to use and the ability to protect all of the different OS and application components. I have not ran across any issues or dislike using this system, this far! I highly recommend a STORServer Appliance powered by CommVault. The bundled support and hardware package married with Simpana software, truly makes this backup and recovery system a sure thing. A CommVault Simpana Appliance helps to alleviate the daunting tasks of backup and recovery. It benefits the monitoring of jobs in a simple view to remedy any backup concerns. The recovery of physical and virtual machines is effortless. "Feature rich, but very complex"
The product is very feature rich and capable of many valuable processes in the backup space. Backup restorations are dependable. The interface is overly complex and convoluted. Implementing is tedious and time consuming. Day to day administration is also time consuming. Look into hyper converged solutions to save costs on backend storage. Data loss and virus protection. The GUI is pretty good. Navigation from page to page is good too. 3. The subclient shows a storage policy of SP_XYZ but when we go into the ‘Storage Device’ under properties section, it does not show us the policy name. The number of Data backup streams displayed is also not correct. 4. While trying to do a DB2 restore to end of logs the following message appears repeatedly, “Database in use”. The restore without the end of logs or point in time work fine. 5. Redirected restore to a database on the same host and same instance errors out with the following message after running for many hours: The archive log file is not associated with the current log sequence. We had to figure out the log file name, manually delete it and then run: "db2 rollforward db DBNAME to end of logs" and then it worked. Make sure you test the product out with your specific requirements. The product has great potential, some things still need to be worked out in my opinion. I used this product a year ago and so most of the issues that I have described above must have been resolved. Please verify that they have been taken care of. Enterprise wide backup and restore operations for RDBMS's such as IBM DB2, SQL Server, Oracle. Some functions tested fine, others were still being worked on. Based off of 10+ years in IT and in college. Nothing has come close to the reliability and robustness of this software. Over the years I have used other products and loath not using Commvault sooner. They are truly the best in the market. Commvault has a few issues. I have called them multiple times for support. But after getting a tech on the phone, the issues were always resolved in a timely manner. They are the best for a reason. I wish we would of moved sooner. "CommVault is the way to go"
I use CommVault daily for two customers and I really like functionality and having everything in one CommCell in a single area. This allows us to control and monitor the environments easily and efficiently. The functionality of CommVault is very straightforward and everything is just a "right click" away. They have changed their reporting from previous releases and I find the new reporting functionality to be a little lacking now. Though you have the reporting all in one place on the CommCell and the Cloud, I find some of the information is not as it use to be. CommVault is great for backing up servers and desktop/laptops. We're constantly adding different types of servers (e.g. VMware, Unix, GreenPlum, Exchange) and CommVault will make sure to work with the company to help when implementing those environments. One of the greatest benefits of CommVault is their technical support. No matter how big or small the issue is CommVault will do with they can to fix the issue. this software is very good at both back AND restore. I have never had any trouble with backing up files or mailboxes and the restore process is very granular and intuitive to use. I keep the company files and emails safe with this product, if a server were to fail, I know that I have a good backup from which to restore it. "Great product - flexible, intuitive, powerful." Great solution for enterprise backup solution. It is policy-driven, and its retention settings and copy policies are extremely powerful. The role-based security empowers division-IT staff to kickoff their own backups and restores. Also works well using either builtin replication, or hardware replication on storage target. All operations, including agent deployment can be managed from the Commserve (central console). Experienced issues with SNAP Protect (SAN array snapshots) with a NetApp Filer. The snapshots did not always age off appropriately, which caused the storage journal to occupy excessive disk space on the array. Overall, a phenomenal product. However, I would caution against SNAP-Protect. Enterprise backup and archive solution. The mutli-copy sotrage policies and retention rules proved to be extremely powerful and automated. The division-IT staff were enabled with a powerful backup and restore solution without needing to manage it themselves. "I am the primary CommVault backup administrator for my company." I like the diversity and the amount of features available. I am capacity based and I like the scalability I have as my data grows. Support is fantastic. 90% of the time they solve my issue. The other 10% is because of either user error or that we as a company didn't follow a CommVault best practice knowingly. There is a little bit of a learning curve at first but if you take a/some training classes it becomes much easier. Take a training class. It is very much worth the cost. It will save you a lot of aggravation and time by not having to call support so often. We solved our number one issue with backup windows when moving to CommVault. We also cut our tape usage 95% and primarily use disk storage with deduplication. Multiplatform functions allow backup and restores from almost any vendor. Being able to restore netapp ndmp to Windows shares. New vmware features are really good with the ability to boot backed up vms from within the product. Reporting is very basic at times. Its not easy to get a plan of what backups are running when. Confusing interface after using other versions where options change location / function almost at every update. Training is essential. Over spec media agents as in the future it will bite you hard if you run into performance issues. Backing up multiple multi tennancy customers wuth ease allowing easy isolation with subclients and media agents. Allowed us to concentrate backup and archive policies to efficiently use backend space with dedupe. I've pane of glass to manage all your backup infrastructure. Shortage of backup storage is a thing of the past. The data duplication and synthetic chill backups are little short of amazing. Its easy to archive data using this tool. it archive the Terabytes of data easily without any problem. No issue occurs while copying the data. So its makes storing, managing and discovering file content a whole lot easier. only prerequistes like some kind of Antivirus exception required to run this program . "CommVault - Professionalism at its Finest"
The professional support I receive from CommVault is fantastic. Everyone I talk to in the organization has been very helpful and attentive to our needs. Support agents and engineers have no problem helping you understand things until you feel like you are in control of the situation. The product has also been very reliable with very few maintenance needs. I have very few dislikes when it comes to my CommVault experience. There is a little bit of a learning curve and the reporting could be a little more powerful. Backing up our production systems and is being used as part of our DR solution. "Hard to setup and manage"
The software is very powerful for cross platforms backup. The SQL agent always has problems with a cache memory and keep interrupting the backup schedules. The user interface is confusing. If you only need backup for Microsoft servers, try different solutions. "Good solution for long term backups"
Reliability for long term back up solution. Clear organization of backups and easy to browse full backup history. Navigation through the system is becoming a bit dated. Provides a solution for long term backups. "Can't sleep at night without it"
Simple, easy to configure scheduling. Many built-in scenarios. Kind of a steep learning curve to get the right items in backup, but that isn't a bad thing. Backup services for physical and virtual storage. "Good back up for vms and unix"
"Good Support And Great Software"
I would say great support and with built-in automation and customized reporting user can spend less time on routine administration, and more time delivering value to the business. Easy to use, simple and intuitive backup solution which is quite simple to configure and architect from scratch. "1st Class for a reason!" Reliability, integration and ease of use. Pricing and licensing options. Current licensing features do not take into consideration marginal additional backup needs. Make sure you budget for the cost of proper licensing. "A Most Excellent Single Pane of Glass Backup Solution"
The piece of mind knowing that all of our valuable data is safe and the excellent customer service makes this product well worth it. Customer service representatives are very polite, and provide prompt, expert support. The licensing is rather expensive, but that pretty much goes with all modular software licensing models. Just adding one Terabyte can hurt the pocketbook, but as compared to other solutions it is not the most expensive. This product solves our need for backup and disaster recovery as well as audit requirements. It also helped us tremendously by going from multiple backup solutions to one. Previously, we were using Symantec Backup Exec, and CommVault is much superior in every way. "Backup solution for the Enterprise"
Commvault is very enterprise ready. It's configurable and effective. The configuration is complex and esoteric. Need staff certifications for deployment. The media agents aren't too beneficial for data visualization and archiving old data. It helps reduce the storage footprint for customers profiles and acts as a good long term back up solution. "Best backup software i've ever used"
Commvault agent are expensive for database server. The cost is pretty high, but it's well worth the expense. Definitely look into a POC for your environment. It is worth the time. * We monitor all Commvault Complete Backup & Recovery reviews to prevent fraudulent reviews and keep review quality high. We do not post reviews by company employees or direct competitors. Validated reviews require the user to submit a screenshot of the product containing their user ID, in order to verify a user is an actual user of the product. Hi there! 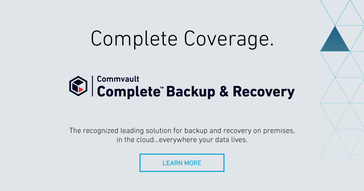 Are you looking to implement a solution like Commvault Complete Backup & Recovery?